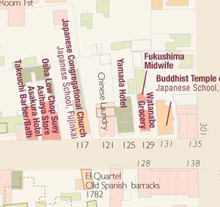 In Santa Barbara, the tiny Japantown was mainly on Canon Perdido Street, just off downtown. What's unique here is that churches and businesses sit amidst the remains of the old Presidio of Santa Barbara. They're also quite close to downtown. Several buildings adjacent to Japanese-occupied buildings are (in 1940) historic adobes, and all the property lines are a little bit askew (aligned to the Presidio quadrangle, rather than the modern city street grid). Creation of the State Historic Park in the 1960s resulted in the adobes being restored, but many of the Anglo-period buildings in their midst were torn down. Both Japantown Atlas and PCJ discovered that Oakland was a far bigger settlement than we imagined. There was a dense settlement in Chinatown and outlying businesses in West Oakland and all along the major arteries (San Pablo and Telegraph Aves and East 14th Street). But it was also one of the origins of the flower growing industry, starting with the renowned Domoto Brothers Nursery. By 1940 there were dozens of flower nurseries from Richmond to Hayward. What's neat about Oakland is all of the nurseries have street addresses, so I can find them. They're strung out along the streetcar lines and railroad lines that provided access to the flower exchange in San Francisco. Nearly all of these nurseries are gone now, but thanks to our detailed source maps, we found one nursery still in operation in East Oakland, and dwellings from two other vanished nurseries. We found another nursery still surviving in Pasadena, on Lincoln Avenue. We're told the Nikkei (Japanese heritage) retired a few years ago, but it was neat to see the business still serving its neighborhood. More than a dozen nurseries were once spread around Pasadena; someone had to supply all those wonderful street trees and lush gardens that grace this city of bungalows. 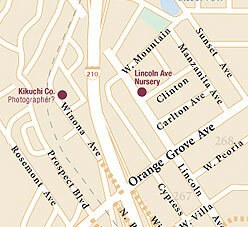 As for the Japantown (such as it was), a lot has been subsumed by freeways (I-210, I-710, and Hwy 34). (You can get a sense of the character of the oldest part of town by walking its tattered remnants - it was a little bit like South Berkeley). Several outlying buildings seem to have survived (according to PCJ); we'll be going down to visit in early 2007 to see for ourselves. You can get an overview of San Francisco, San Jose, and Los Angeles today from the Preserving California's Japantowns virtual tours. I'll be adding historic versions of these three maps to this website, along with detailed maps of the core areas of interest. Temporarily, there are also quite a few detailed maps (mostly saved as PDFs) at my Pease Press website, where this hobby first started to get out of hand. Today's Japantowns are all a little different. I've written too much on San Francisco; I'll just add that my maps so far ignore outlying business clusters, particularly those downtown in the produce/import/export districts adjoining downtown, and Chinatown (I have mapped South Park and South of Market). To consider San Francisco without acknowledging the enormous number of satellite towns and cities (Oakland, Belmont, San Mateo, Alameda, and many others) would not suffice (hence this project). But returning to my intended theme, within San Francisco, for the most part, most of the institutions are right in Japantown. Same with San Jose, though it was much smaller before WWII than after. Most San Jose businesses, churches, etc. are located just a couple blocks from 5th and Jackson and the string of fruit canning factories along the SP railroad main line. But San Jose has its own satellites - farms in Agnews, Berryessea, and Coyote, out towards Mountain View. (Alas, most of these farmers had RFD addresses). Maybe the strength of the San Jose community was in part the large number of people who did NOT live there, but came into town now and then. (Or town came out to them - a friend recounts growing up after WWII in Coyote, a good ten miles south of San Jose, and a couple days a week the Nishimoto Fish Market sent out their delivery truck to all the farms with fresh fish and tofu). As for Los Angeles, it's big and varied. Looking back in time answers a lot of questions about the modern-day place. Why is there a railroad spur winding behind the JACCC/Japan America Theater? It was headed to a cluster of industrial warehouses that backed up Japantown in the first half of the 20th century. When I first visited they'd all been torn down in preparation for mega developments that were done in by the real estate bubbles in Japan and LA. Except now (2006) all the parking lot deserts are being built up with huge new apartment projects, and I expect to be properly disoriented by the next time I visit. But what preceeded the warehouses? It's worthwhile to look even farther back -- the earliest Sanborn maps (1874) show a tug of war developing between the old ways and the new - the arrival of the railroads leading to the development of the river plain with industrial clamor, crashing rail cars and a noxious soap factory crowding out the bungalows and cottages on tree lined streets. If you see one house today, over by the Catholic church, it's a survivor of an entire neighborhood. The maps for 1915 still several adobe dwellings; the map for 1874 shows big Victorian mansions surrounded by orange trees, and the old Acequia Madre (water ditch). Which you can look up on even older maps to the days of the Mission and Mexican farms along the Los Angeles River that still flows (channeled) half a mile to the east. The Nikkei got the flood zone and made it home. One last thought about LA is that being so big, there are many more flavors of Buddhist churches serving LA than we find in San Francisco. Many more types of businesses. On the other hand, most of the residential uses (save for the single men living in hotels on and off East First Street) are elsewhere. Schools and most Christian churches are mile to the east, in Boyle Heights, or off to the west in outlying suburbs and still-agricultural towns. ( Boyle Heights is on my to-do list).